If you're renovating a bathroom on a concrete slab and want to reposition the toilet, you must break up the concrete and relocate the waste pipe for the toilet. This is not a simple plumbing task. You must feel comfortable breaking up concrete, cutting into the existing waste line and installing a new pipe. If you do not feel confident in your ability to complete this process, leave the job to a licensed plumber. Turn off the water shutoff valve to the existing toilet then flush the toilet to drain water from the toilet tank. Sop up any remaining water from the toilet tank with a towel. Remove the flexible water supply line from the water shutoff valve with a wrench. Loosen the two bolts that mount the toilet to the toilet flange, which rests flush with the floor, then pull the toilet off of the flange. Place the toilet off to the side. Scrape the old wax seal off the top of the toilet flange with a putty knife and discard it. This will help prevent getting the wax seal all over the floor while you work. Place two marks at each side of the toilet flange onto the concrete approximately 12 inches apart. Place two additional marks where you plan to install the new toilet. Again, keep both marks approximately 12 inches apart. Snap a chalk line between the marks to create two straight lines. This shows you where you need to cut up the concrete. Cut along the lines on the concrete with a circular saw equipped with a masonry blade. Take your time and do not force the blade through the concrete. Break up the concrete with a 5-pound sledgehammer and discard it. Excavate the gravel and dirt from the trench to a level that matches the depth of the existing drainpipe for the toilet. Dig the trench so it has a slight pitch upward from the existing drainpipe to the location of the new toilet flange: 3 inches per every 10 feet is adequate. Place a tee junction over the existing drainpipe where the toilet flange is located. Mark each end of the tee junction onto the existing pipe. Cut the section of pipe out with a cast iron cutter or with a reciprocating saw if the drainpipe is made of PVC plastic. This will completely remove the original toilet flange and the pipe that connects the flange to the drainpipe. Slide rubber boots onto both ends of the tee junction then place the tee junction in line with the existing pipe. Slide the rubber boots half over the existing pipe and half over the tee junction. Tighten the clamps on the boots with a ratchet and socket. Cut a section of PVC pipe that will extend from the tee junction to the location where the drain will turn upward and mount to the toilet flange. Clean the ends of the tee junction and the ends of the PVC pipe with PVC cleaner then spread PVC adhesive around the ends. Join the PVC pipe and the tee junction together. Place a PVC elbow onto the end of the pipe. Clean the pipe and add adhesive just as you did in the previous step. 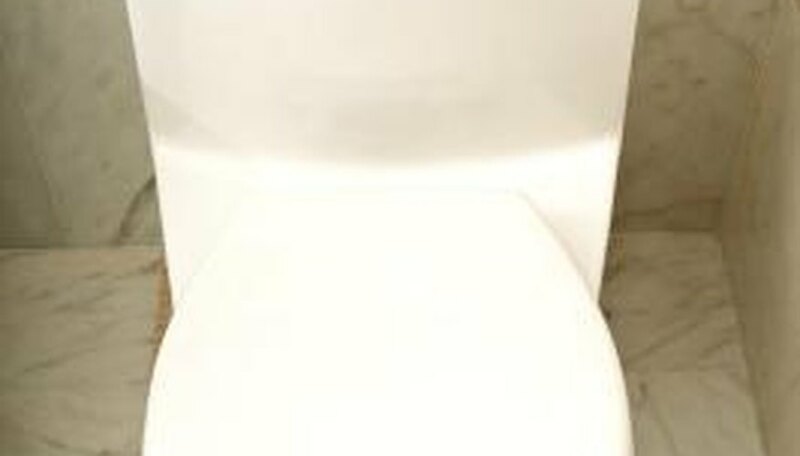 Place a PVC toilet flange onto the elbow. Again, glue the flange in place as you glued the previous pieces. However, when you install the flange, make sure that the flange rests level with the surface of the concrete floor. Fill the trench with the gravel and dirt previously removed until the level of dirt rests at the bottom edge of the concrete slab. Mix enough concrete to fill in the remainder of the trench. The amount of concrete you need depends on the length of the trench. For a small amount of concrete, use a 5-gallon bucket. For a large amount, use a wheelbarrow for mixing. Add concrete to the hole then level it with a trowel. Allow 24 hours' curing time before you reattach the toilet to the flange.